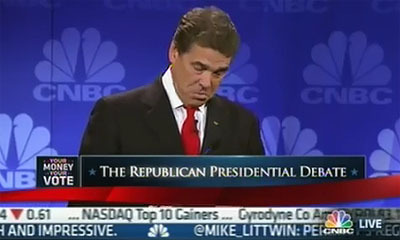 I’m pretty astonished at the number of people sympathizing with Rick Perry’s debate debacle last night because, hey, we’ve all had a brain freeze, right? Happens to the best of us. I guess I should join in the fun. So here it is: I’ve been on TV exactly once, and I did exactly what Perry did. I told Bill Moyers I had three points to make, I made two of them, and then I trailed off and forgot the third. Luckily, it was a taped show, and that bit ended up on the cutting room floor. So none of you ever saw it. So does this mean I should cut Perry a break too? Please. Sure, this could happen to anyone. But Perry didn’t forget a complicated point, and he didn’t forget something he had just formulated in his mind. He blanked on a single word. And he blanked in a way that made it obvious this wasn’t something he really knew or cared about. It was just a talking point. He was like a kid reciting a poem in front of class and forgetting his lines. I think people in some ways are letting Perry off easy precisely because this “gaffe” was so egregious (we’ve all frozen up in front of audiences before. I think I can remember every time it’s happened to me with excruciating accuracy)….But put aside the queasy awkwardness of the moment for a second. Perry couldn’t remember that he wants to shut down the Department of Energy!? For weeks, energy reform was the only substantive policy he’d put forward. Energy is still one of the only topics he can discuss with anything approaching fluency. But he couldn’t remember he wanted to shut down DOE? ….His performance last night confirmed — with an exclamation point — the negative narrative of his entire campaign. Everyone could forgive Ron Paul if he spaced out on the name of a cabinet agency he wanted to shutter, because everyone knows that Ron Paul knows what he knows and has no problem explaining himself under normal circumstances. People are much more unsure about Perry and he compounded that uncertainty last night. It’s fine to say everyone has these bad moments. That’s true. Everyone makes mistakes. What you look for are patterns. Last night was so deadly because Perry reinforced his pattern rather than deviated from it. And he was already on borrowed time. I demand abject apologies from everyone who gave me a hard time over this. Rick Perry is too dimwitted to be president. End of story.